Online recipe websites are great. Even better when they have Android and iPhone apps like epicurious.com and sparkrecipes.com. But what is a couple to do when all of the great desserts make 4-6 servings? Reinvent the recipes! Tonight, I continued in my fun to make a blueberry crisp. 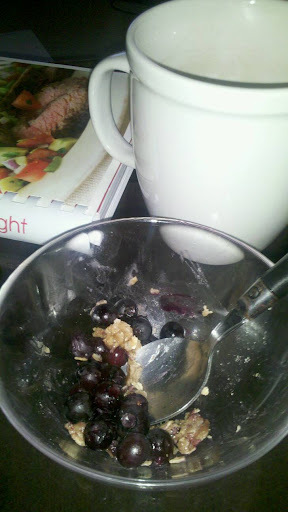 Most of the healthful sites use an oat topping over blueberries with a hint of lemon juice. If I’ve learned anything about cooking over the years – and from Rachel Ray, who is self-admittedly not a baker – it’s that cooking is about taking the key techniques and reinventing them. I didn’t have the proper dishes to make this, so I took a 1 cup measuring cup, lined it with aluminum foil to make a personal serving size and built it right in the aluminum foil shells. Preheat oven 350 degrees. In a small mixing bowl, toss the blueberries in the lemon juice. Divide them evenly between two oven-safe personal serving size dishes. In the empty mixing bowl, blend remaining ingredients until well coated with the melted butter. (Add a drizzle of water if addition moisture is necessary). Divide in half and top the blueberries with the mixture. Bake for 25 minutes, or until topping starts to brown. Serve immediately with a glass of milk, or with a small scoop of ice cream! I bet Sandra Lee may even approve of my dessert. It was Semi-Homemade!